While GuardianPro 5.02, NetGuard’s entry into the bandwidth management arena, installs easily and is well documented, its interface is somewhat difficult to manipulate. 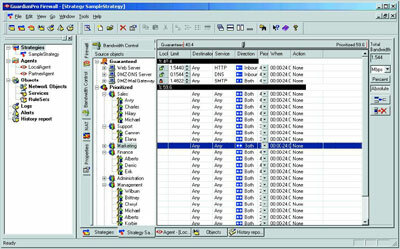 Resembling a spreadsheet, the interface is loaded with numerous windows and click-on options (Figure 4). After several false starts, I found myself in the application’s Bandwidth Control Strategy Explorer. Within Strategy Explorer, you’re first asked to create a “bandwidth strategy” by separating your available resources into three categories: guaranteed, prioritized and standby. Next, you add network objects, selecting from users, hosts, networks and groups. Finally, you establish the rules governing these objects and decide how bandwidth will be sliced and diced. Options you can choose include destination, service, direction, priority, when (hours and days), and action. You then can use Strategy Explorer to move rules around and change option values. Figure 4. GuardianPro’s Bandwidth Control Strategy Explorer lets you allocate bandwidth for users and groups. GuardianPro’s Bandwidth Management Control Component allows you to use a “balance beam” slider to allocate bandwidth between the guaranteed and prioritized categories. For a quick test, I attempted to allocate 50 percent to each category. With the slider, I came close to this figure; still, it took fine mouse movements to do it. It would’ve been nice to have an option box where I could’ve typed the exact percentage. Perhaps GuardianPro’s best feature is its real-time network monitoring capability. You can choose from a graphical or list presentation denoting various network traffic flows. You then choose from a multitude of 2-D and 3-D displays, and you can customize and filter traffic views. As it addresses the bandwidth needs of individual users and groups, I found that GuardianPro offers a unique approach to bandwidth management. It forces you to take a global view, making you think about how exactly you want to allocate your total network bandwidth.